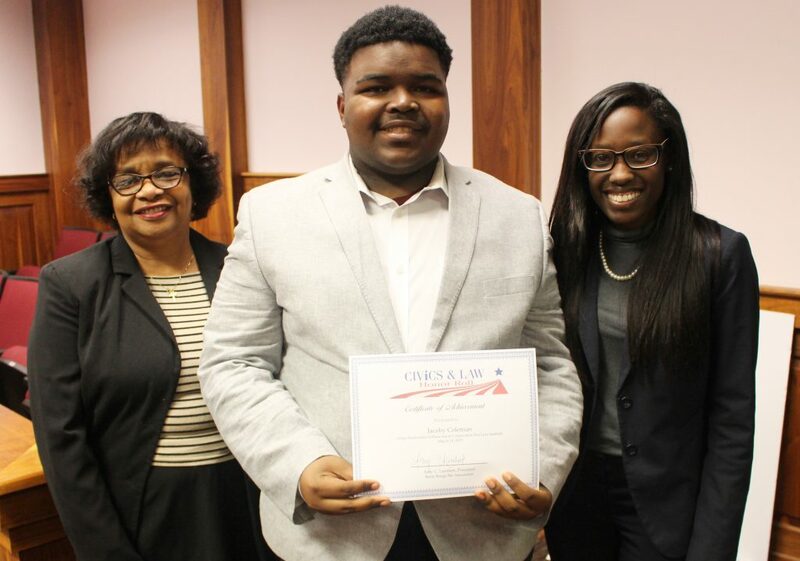 UREC Pre-Law student, Jacoby Coleman, is presented with an American Bar Association Civic & Law Honor Roll Certificate from Baton Rouge Bar Association representatives Lynn Haynes and Candace Ford. The honorees were formally announced and recognized during the Pre-Law Institute’s culminating event—a mock trial, which was held at SULC’s moot courtroom on Tuesday, March 19, 2019. During the mock trial pre-law scholars presented and argued a criminal defense case before a volunteer mock trial judge and jury. Following deliberation, the volunteer jurors decided unanimously in favor of the prosecution. Pre-law scholars Cesar Williams, Jayda Woods and Jailen Wright prosecuted the case. Attorney Troy Humphrey served as mock trial judge. Volunteer jurors included: Amanda Collura-Day, Kean Miller, LLP; Sally Ellwein, Capital Area United Way; Michael Johnson, UREC Board Member and CSRS, Inc.; and Baton Rouge Chapter of the Links, Inc. members Helena Cunningham, Yolanda Dixon, Dr. Angela Gooden, Dr. Jacqueline Hill, Mauretta Wailes Elbert, Britney Temple, Erin Monroe Wesley and Judy Johnson White. SULC students also volunteered in the jury. UREC’s College & Career Ready Pre-Law Institute is a 14-week learning opportunity that introduces students to civics, law, and the criminal justice system, while affording them the opportunity to study under instructors who are law students at SULC. SULC student Alexandra Lawson served as program instructor, and SULC student April Love was the site coordinator. View the mock trial photo library here. View the Civics & Law honorees here.